Tea is a popular beverage both for enjoyment as well as its medicinal properties. Green, white, oolong and black teas are all harvested from the same tea shrub, Camellia sinesis, which is very easy to grow. Here’s how to make the most out of your tea shrub and reap the benefits with the phenomenal taste of fresh tea. Tea shrubs grow well up to the zone 8 hardiness zone and prefer humid climates. Seedlings and young plants should be planted in the shade and then transferred to an area with full sun when they mature. If you don’t have an area outside, or if the temperature is too cold, tea shrubs can also be grown as indoor plants. The mature tea shrub can reach heights of 6-10 feet if left untrimmed. Camilla sinensis prefer acidic, sandy soil that is well drained. If you have less than ideal planting conditions amend the soil by adding in missing components. If you need to adjust the pH, there are fertilizers available for nearly any soil situation. If you are planting your tea in a container, mix sphagnum moss in with the potting soil. Once you have found the best location for your shrub and prepared the soil, you are ready to plant. You can start your tea shrub from seeds, but many find it easier to use cuttings or buy a shrub from a nursery. Begin by digging the hole in the sandy soil. The size of the hole needed will vary depending on the size of the shrub you are planting. You will want the hole to be deep enough to completely submerge the roots along with a couple inches of the stem/trunk. Add a small amount of water to the hole. Remove the shrub from its current container and prepare the roots by loosening tight clumps. Your goal is to break up the dirt and loosen the roots without breaking them off. Place the roots into the hole and cover with soil. Cover the ground with 2-4 inches of mulch to help retain moisture and reduce weeds. Water your plant frequently to keep the soil moist, especially on warm days. Try to moisten the soil, but avoid soaking the area. Apply fertilizer to the area directly around the shrub periodically to help with growth. Camilla shrubs are not heavy feeders, so using an acidic fertilizer at half-strength applied just once every 2-3 weeks will most likely be sufficient. Once your tea shrub is planted, it just needs loving care, plenty of patience and time to mature. Shrubs should have 3 years to grow before you begin harvesting the leaves. When your tree is established, you will want to start harvesting the leaves. The various stages of the leaves along with special processing methods that allow for different levels of fermentation produce the varieties of tea. 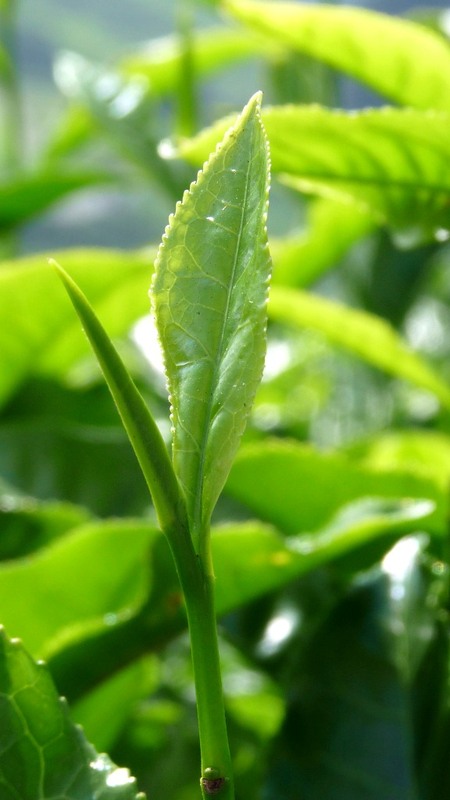 For green tea, pluck the youngest leaves and buds, this typically consists of the terminal 3 leaves and the terminal bud. Allow the leaves to dry, away from direct sunlight, for several hours. Next you will want to either steam or pan heat your green tea leaves. To steam the leaves, use the same process as steaming vegetables and steam for about 1 minute. To pan heat the leaves, place the leaves in a pan and heat to about 500° F for 15 minutes. Keep the pan in constant motion to avoid burning. To dry the leaves, place them in a single layer on a baking sheet in a 250° F oven (no hotter than this) for 10-20 minutes. Dried leaves can be stored in an air-tight container, in a cool, dark place until ready to use. For oolong tea, pluck the youngest leaves and buds, this typically consists of the terminal 3 leaves and the terminal bud. Place the leaves on a tray or towel and allow them to wilt under the sun for about 45 minutes. Move the leaves out of the sun and heat and allow them to sit for a few hours at room temperature. Mix the leaves around every hour while they are sitting. As the leaves begin to dry, you will notice the edges beginning to turn red in color. For black tea, pluck the youngest leaves and buds, this typically consists of the terminal 3 leaves and the terminal bud. Place the leaves between your hands and use a rubbing motion to crush the leaves until they begin to darken and turn red in color. Place the leaves on a tray and leave them set in a cool place for a couple of days. White tea is only harvested in the spring when the very newest of leaves are available. Pluck the newest leaves and buds, just as they are emerging on the plant, these will still have the white fuzz on them and the buds will still be closed. The leaves will have a silver look. Spread the leaves out on a pan and allow them to wither and dry. Add herbs, dried fruits or edible flowers to your tea before steeping for an endless variety of flavors. Tea plants produce fragrant flowers that can be very attractive to insects, especially moths. White tea has three times more antioxidants than green or black tea.